The richest zip code in America, one of the most active real estate markets on the planet nad home to some truly out-of-this-world amenities—welcome to Miami. According to the 2018 edition of Knight Frank’s Wealth Report, $1 million will buy you just 16 square meters (about 172 square feet) in Monaco, 22 in Hong Kong, 25 in New York or 28 in London. But it will buy you 78 square meters (about 840 square feet) in Miami. Perhaps that’s why hedge-fund managers and other billionaires are relocating here—and breaking price records in the process. If you’re looking for a posh place to call home, you’re in the right town. Despite a price reduction in May, a 20,000-square-foot mansion at 46 Star Island Drive, now priced at $48 million, is still the most expensive single-family home listed for sale in Miami-Dade County. Built in 1923 by Carl Fisher, the property has more than 40 rooms, including 10 bedrooms, three offices and a 3,000-bottle wine cellar. Oh, and don’t forget the 255 feet of frontage on Biscayne Bay. Hitting the market at $38 million, 370 S. Hibiscus Drive in Miami Beach is the priciest listing on ritzy Hibiscus Island. The three-story, 10,754-square-foot home was built in 2016 and has five bedrooms, a home theater, elevator and yacht dock. If you prefer to build your own estate, how about picking up eight acres of vacant land on Indian Creek Island Road for $150 million? That parcel, consisting of four waterfront lots, is owned by Latin singer Julio Iglesias. “This is a once-in-a-lifetime opportunity to own one of the most magnificent trophy properties in the U.S.,” says Jill Eber of The Jills team at Coldwell Banker Residential Real Estate, the listing agent. The condo market is lighting up the skies above the Magic City. A few stars: Fisher Island, which according to Bloomberg is the richest ZIP code in America, comes through with the most expensive listing to date. The 10,194-square-foot penthouse at Palazzo Della Luna, slated for completion in the summer of 2019, boasts seven bedrooms, eight full and two half baths, a stainless-steel pool and a 7,322-square-foot private rooftop terrace. The price: $40 million. The 11,500-square-foot, two-story Carlos Ott Penthouse at Echo Brickell has four bedrooms, private elevator access, a private gym and an indoor pool. The owner of the $42 million unit will receive a personal consultation with Ott to customize the designer-ready penthouse. Car enthusiasts might be intrigued by the $32.5 million penthouse at the ultra-luxury Porsche Design Tower in Sunny Isles Beach, a project that is reportedly home to 22 billionaires. In addition to five bedrooms, an office, family room, two private pools and 2,800 square feet of flex space, the 19,403-square-foot space features a 2,200-square-foot car gallery that will allow residents to house up to 11 prized vehicles—right within the penthouse. Remember when a second parking space was considered a lavish amenity? How quaint. Now properties come with access to a yacht if yours happens to be in the Mediterranean while you’re in Miami. The Ritz-Carlton Residences, Miami Beach caters to the ultimate marina-living lifestyle, with unlimited access to The Residences’ private captained day yacht, a Frauscher 1017 Lido. If travel by sea doesn’t interest you, how about by air? 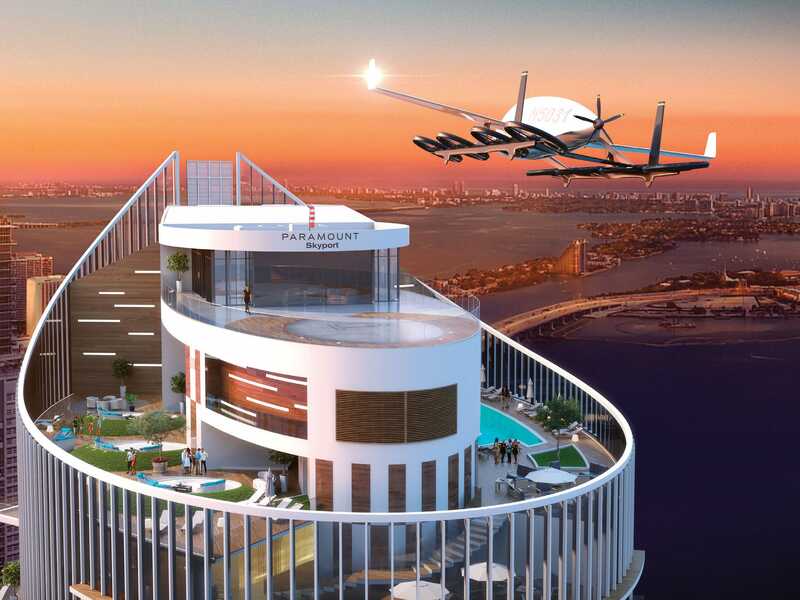 Paramount Miami Worldcenter developer Dan Kodsi is preparing for the future of urban aviation—flying cars—by modifying the rooftop design of the tower to accommodate a 5,000-square-foot Skyport atop the new 60-story Miami building. In addition to an ice rink, bowling alley, driving simulator, and movie theatre, the Estates at Acqualina towers on Sunny Isles will feature a tech heaven where residents can socialize while watching the market and making trades. One of the newer luxury amenities available in Miami is invisible. 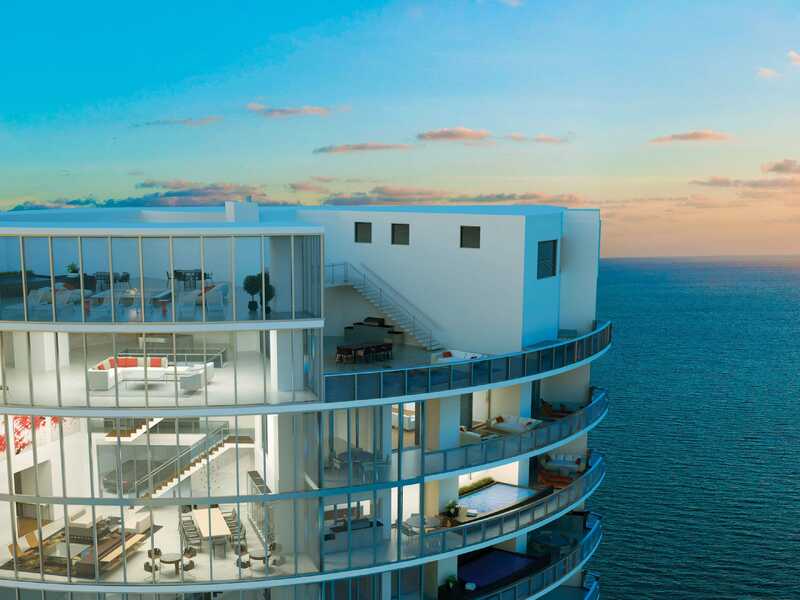 The buyers of the $36 million Penthouse and $29 million Beach House at Regalia in Sunny Isles Beach will receive a one-of-a-kind scent created for them by the olfactory team at 12.29, also known as the perfumers to Valentino, Lady Gaga and Patek Philippe. Miami certainly has its share of elite architects lending their star power to local projects. 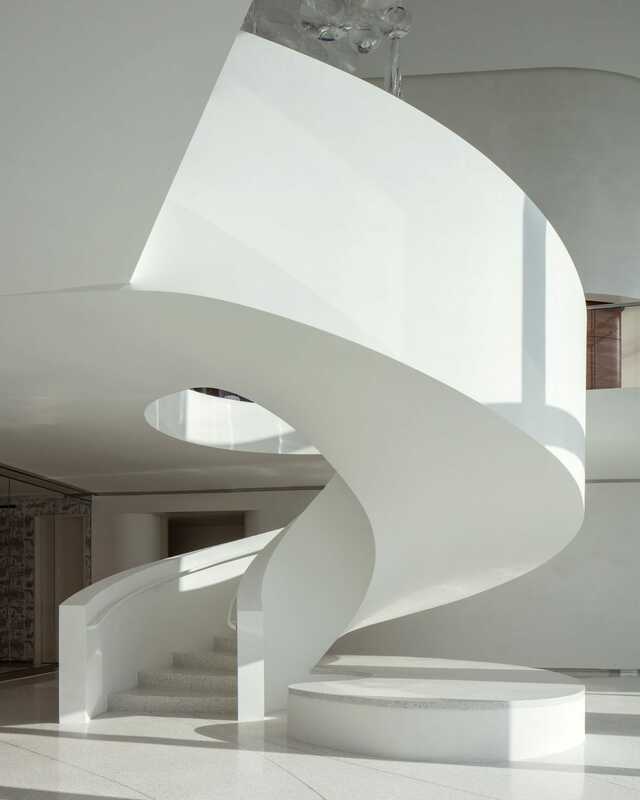 Pritzker Prize-winning Herzog & de Meuron, the visionaries behind the Tate Modern in London and the Perez Art Museum Miami, designed Jade Signature in Sunny Isles Beach with a focus on ultra-luxe living. Echo Brickell, a boutique high-rise in Miami, was designed by internationally recognized Carlos Ott. Parisian interior-design firm PYR, led by Pierre-Yves Rochon and known for creating luxury hotel interiors worldwide, designed the interiors at Jade Signature. 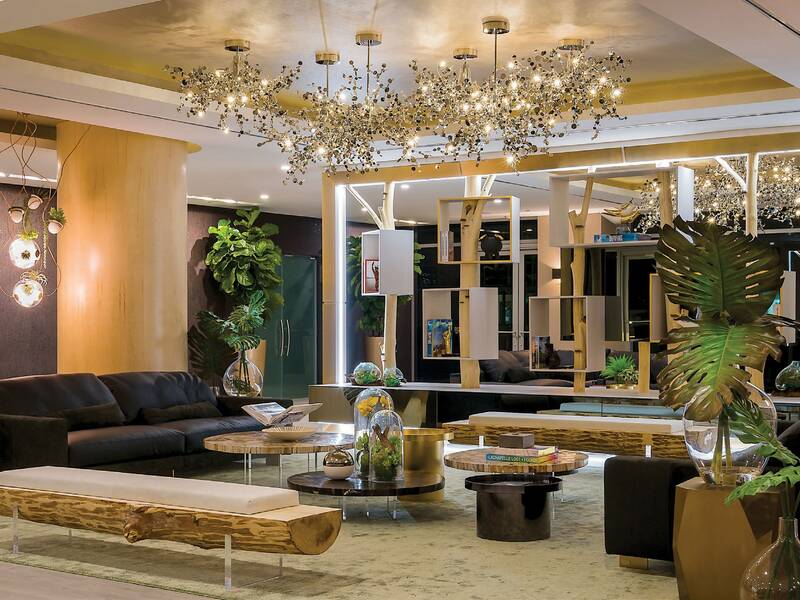 Award-winning Brazilian designer Debora Aguiar designed the stunning penthouses at 1 Hotel & Homes South Beach, where she’s setting a new trend: building the future of architecture with culture and natural materials. “I can’t conceive an idea without the presence of nature,” she says. “I like to explore the natural light, bring the green to the spaces and blend materials such as reclaimed and certificated timbers.” And at Melo Group’s new Arquitectonica-designed Aria on the Bay, nature-inspired interiors by Morada Couture will surely thrill future resident Giancarlo Stanton and Timbaland.